Why fool around with dirty, obsolete, uncool, relatively weak, and dangerously radioactive nuclear fission when you can use clean, cutting edge, trendy, more powerful, and practically radiation-free nuclear fusion? Because we can't figure out how to build a blasted fusion reactor, that's why. Researchers have been promising us a workable fusion reaction "in the next ten years" for more than half a century now. To me they look like Lucy telling Charlie Brown to come kick the football just one more time. Methinks the problem is just a tad more difficult than they are willing to admit to their investors. This is also one of two reasons why fans of mining Helium-3 on Luna are actually trying to sell you swamp land in Florida. Magnetic confinement fusion tries to hold the frantically squirming fusion plasma in a complicated magnetic field. I've been told this is about as easy as using a web of rubber bands to hold a blob of gelatin or trying to nail Jell-O to the wall. Every time they figure out how to add more magnetic fields to deal with the latest fusion instability, the fusion plasma figures out three more new ways to wiggle out. And inertial confinement fusion is shooting at a speck of fusion fuel with hundreds of lasers arranged like a three-dimensional circular firing squad, and hope that if you get lucky the resulting fusion explosion doesn't scrag the reactor. But if they can ever get it to work, woo-boy, then we'll be cookin' with gas. Fission weapons (aka "atomic bombs") did bring an end to World War II, but nuclear scientists did not rest there. The second way to use nuclear physics to release vast quantities of energy is by nuclear fusion. By 1951 the first fusion weapon had been designed, the Teller-Ulam thermonuclear weapon (aka "H-bomb"). Fission was now old-hat, fusion was tapping the same source of power as the freaking sun. It was the energy of the future. And as year overtakes year, fusion power remains the "energy of the future", it never becomes the energy of today. As with most things it is far more difficult to do something constructive than to do something destructive. Scientists all over the world have been trying to develop fusion power since the 1950's, and they are still far away from the "break-even" point (where they actually get more energy out of the fusion reactor than they put in to kick start it). They keep working on it, though, because the benefits are huge. You get more energy from a gram of fuel, there is no chance of a runaway reaction (it is hard enough just to keep the reaction running), no chance of large-scale releases of radioactivity, little or no atmospheric pollution, the fuel is mostly harmless light elements in small quantities, waste has only short-lived radioactivity, and it does not produce weapons grade plutonium as a by-product. There are two basic operations possible in the universe, analysis and synthesis. That is, breaking one large object into smaller parts, or assembly smaller parts into one larger object. The ancients called this "solve et coagula." With fission, you take one large unstable atom and break it into fission fragments (aka "split the atom"). With fusion, you take two or more small atoms and fuse them into one larger atom. In both cases, when you weigh the things you start with and weigh the result, you will find the result weighs less. This is know as the binding energy mass defect. It represents the amount of matter that is turned into energy. Everybody knows that e = mc2, but unless you've had a physics class you may not know that c (the speed of light in a vacuum) is a mind-boggling huge number, and squaring a mind-boggling huge number makes it astronomically huger. Bottom line is that microscopic amounts of matter create titanic amounts of energy. The conversion is 1 atomic mass unit = 931.494028(±0.000023) MeV. D-T fusion starts with deuterium and tritium and has a result of one helium-4 atom and a neutron. The starting mass is 2.013553 + 3.015500 = 5.029053. The ending mass is 4.001506 + 1.008665 = 5.010171. Subtracting the two, we find a mass defect of 0.018882. Multiply by 931.494028 to find an energy release of 17.58847 MeV. This is rounded up in the table below to 17.6 MeV. As a side note, fission and radioactive decay makes atoms become smaller atoms, until the atoms become atoms of lead, where they are stable (i.e., they do not decay or otherwise undergo fission). Fusion, on the other hand, releases energy as you fuse larger and larger atoms, until the atoms grow such that they are atoms of iron. After than, fusing heavier atoms actually consumes energy instead of releasing it. Golden-aged science fiction authors E.E. "Doc" Smith and John W. Campbell jr. noted this and postulated space-opera science that required elements in the middle of the periodic table for direct conversion of all the mass into energy. In Doc Smith's "Skylark" series the element was copper (63 nucleons) and in John Campbell's The Space Beyond the element was iron (56 nucleons). But I digress. The Particles table gives the symbols of the various fusion fuels. The particle mass is given if you want to amuse yourself by calculating the binding energy mass defect of various reactions. Jerry Pournelle is pretty sure tramp spacecraft owners will call Deuterium "Dee". For the same reason people call automobiles "cars." Tritium is annoying since it has a fast half-life of only 12.32 years; e.g., after about twelve years half of your tritium has decayed into Helium-3. Use it or lose it. This is why there are no tritium mines. Most reactor designs that use tritium incorporate a tritium breeder. This usually takes the form of a tank of liquid lithium surrounding the reactor, sucking up the neutrons and transmuting the lithium into fresh tritium and helium-4. The infamous Helium-3 is often touted as an economic motive for space industrialization, unfortunately it is not a very good one. There are no Helium-3 mines on Terra, so it is hard to obtain. Space enthusiasts trumpet the fact that there are helium-3 deposits on the moon that can be mined, but they don't mention that it is in a very low concentration. You have to process over 100 million tons of Lunar regolith to obtain one lousy ton of helium 3. It is possible to manufacture the stuff, but it takes lots of neutrons. Basically you breed tritium and wait for it to decay. There is lots of helium-3 available in the atmosphere of Saturn and Uranus, if your space infrastructure is up to the task of traveling that far from Terra. Helium-3 concentration is estimated at about 10 parts per million, which beats the heck out of Luna. Jupiter has helium-3 as well, but its steep gravity well makes it uneconomical to harvest. Helium-4 is also called an alpha particle. It is a charged particle. This means that any fusion reaction that produces alpha particles can be used to generate electricity. The particles are directed by magnetic fields and trappped to extract electrical current. This can be useful if you wish to use that reaction for both propulsion and ship's electricity. The Reaction table displays the various fusion reactions that look promising for power plants and spacecraft. Note that the Deuterium + Deuterium reaction has two possible outcomes and thus two rows in the table. Each outcome has about a 50% chance of occurring. The two lithium reactions are not power or rocket reactions, they are the tritium breeding methods mentioned above. Pay attention to the ⇒ reaction products column. An n means deadly neutron radiation. 4He is not-so-deadly but still annoying alpha radiation. There are many fusion reactions, but only a few are suitable for use as power sources or rocket fuels. There are lots of limitations that you can read about here. Of the candidates, you want to use those with low Lawson criterion, which measures how hard it is to start and maintain the reaction. It is a plus if the reaction only produces charged particles, since these can be turned into elecctricity directly, instead of having to be converted into heat first. Finally it is a plus if the reaction does not release neutrons, because they are not only dangerous radiation, but they have the nasty habit of weakening engine parts ("Neutron embrittlement"), and transmuting engine parts into radioactive elements ("Neutron activation"). Unless you are using the neutrons to breed tritium. The D + 3He reaction is of particular interest for rocket propulsion, since all the products are charged particles. This means the they can be directed by a magnetic field exhaust nozzle. Having said that, while D-3He is aneutronic, if you mix a bunch of deuterium and helium-3, some of the deuterium is going to be wayward and insist upon fusing with other deuterium instead of helium-3 like you want. Sadly D-D fusion reactions do produce neutrons. In theory it is possible to use spin-polarized 3He in the fusion fuel to absorb the neutrons. You will get less energy out of each gram of fusion fuel, but with the advantage of a lot less deadly neutron radiation. The p + 11B reaction is the celebrated Hydrogen-Boron fusion, sometimes called "thermonuclear fission" as opposed to the more common "thermonuclear fusion". It too is aneutronic, but it does have two nasty side reactions. One makes a Carbon-12 atom and a gamma ray, the other makes a Nitrogen-14 atom and a neutron. The first side reaction is quite a bit less likely than the desired reaction, but gamma rays are harmful and quite penetrating. The second side reaction occurs with secondary alpha particles before they are thermalized. However the main draw-back is a truely ugly Lawson criterion. D+3He only has a Lawson of 16, Hydrogen-Boron has an overwhelming 500. On the plus side, in theory the Lawson criterion can be lowered by using antiprotons as a catalyst. Recently (2015) one study suggested that using picosecond laser pulses instead of microsecond could make things easier. The Deuterium-Tritium reaction is easy to ignite (low Lawson criterion), but it uses that pesky decaying tritium. Hydrogen-Boron (a proton is an ionized hydrogen atom) has the advantage of being aneutronic, but is very difficult to ignite, with a whopping Lawson criterion of 500! Helium-3+Helium-3 is also aneutronic, but helium-3 is hard to come by. Which is probably why I could not find any source quoting its Lawson criterion. Proton-proton fusion is what the Sun uses, and what Bussard Ramjets would like to use. Four protons fuse to create an atom of helium-4 and 26.73 MeV of energy. Trouble is that the Lawson criterion is off the top of the chart. Trying to get four protons to simultaneously fuse is almost impossible, short of using an actual star. Of these reactions, the fusion of deuterium and tritium (D-T), has the lowest ignition temperature (40 million degrees K, or 5.2 keV). However, 80% of its energy output is in highly energetic neutral particles (neutrons) that cannot be contained by magnetic fields or directed for thrust. Deuterium, in contrast, is abundant and cheap. The fusion of deuterium to itself (D-D) occurs at too high a temperature (45 keV) and has too many neutrons (60%) to be of interest. 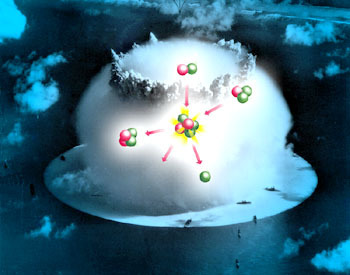 However, the neutron energy output can be reduced to 40% by catalyzing this reaction to affect a 100% burn-up of its tritium and 3He by-products with D.
The fusion of 10% hydrogen to 90% boron (using 11B, the most common isotope of boron, obtained by processing seawater or borax) has an even higher ignition temperature (200 keV) than 3He-D, and the energy density is smaller. Its advantage is that is suffers no side reactions and emits no neutrons, and hence the reactor components do not become radioactive. The 6Li-H reaction is similarly clean. 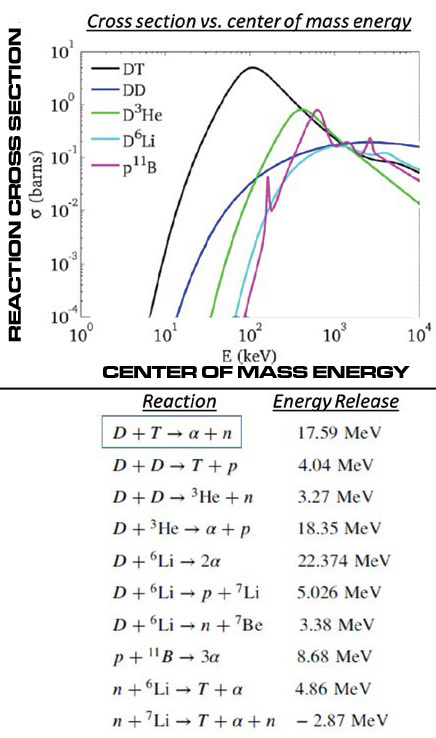 However, both the H-B and 6Li-H reactions run hot, and thus ion-electron collisions in the plasma cause high bremsstrahllung x-ray losses to the reactor first wall. For one thing, forget muon catalyzed fusion. The temperature of the exhaust will not be high enough for torch ship like performance. You might use a heavy ion beam driven inertial confinement fusion pulse drive, or a Z-pinch fusion pulse drive. I don't think magnetic confinement fusion will work — you are dealing with a such high power levels I don't think you want to try confining this inside your spacecraft because it would melt. D-T (deuterium-tritium) fusion is not very good for this purpose. You lose 80% of your energy to neutrons, which heat your spacecraft and don't provide propulsion. 80% of a terrawatt is an intensity of 800 gigawatts/(4 π r2) on your drive components at a distance of r from the fusion reaction zone. If we assume we need to keep the temperature of the drive machinery below 3000 K (to keep iron from melting, or diamond components from turning into graphite), you would need all non-expendable drive components to be located at least 120 meters away from the point where the fusion pulses go off. D-D (deuterium-deuterium) fusion gives you only 66% of the energy in neutrons. However, at the optimum temperature, you get radiation of bremsstrahlung x-rays equal to at least 30% of the fusion output power. For a terawatt torch, this means you need to deal with 960 gigawatts of radiation. You need a 130 meter radius bell for your drive system to keep the temperature down. D-3He (deuterium-helium-3) fusion gives off maybe 5% of its energy as neutrons. A bigger worry is bremsstrahlung x-rays are also radiated accounting for at least 20% of the fusion output power. This lets you get away with a 66 meter radius bell for a terawatt torch. To minimize the amount of x-rays emitted, you need to run the reaction at 100 keV per particle, or 1.16 × 109 K. If it is hotter or colder, you get more x-rays radiated and more heat to deal with. This puts your maximum exhaust velocity at 7,600,000 m/s, giving you a mass flow of propellant of 34.6 grams per second at 1 terawatt output, and a thrust of 263,000 Newtons per terawatt. This could provide 1 G of acceleration to a spacecraft with a mass of at most 26,300 kg, or 26.3 metric tons. If we say we have a payload of 20 metric tons and the rest is propellant, you have 50 hours of acceleration at maximum thrust. Note that this is insufficient to run a 1 G brachistochrone. Burn at the beginning for a transfer orbit, then burn at the end to brake at your destination. Note that thrust and rate of propellant flow scales linearly with drive power, while the required bell radius scales as the square root of the drive power. If you use active cooling, with fluid filled heat pipes pumping the heat away to radiators, you could reduce the size of the drive bell somewhat, maybe by a factor of two or three. Also note that the propellant mass flow is quite insufficient for open cycle cooling as you proposed in an earlier post in this thread. Due to the nature of fusion torch drives, your small ships may be sitting on the end of a large volume drive assembly. The drive does not have to be solid — it could be a filigree of magnetic coils and beam directing machinery for the heavy ion beams, plus a fuel pellet gun. The ion beams zap the pellet from far away when it has drifted to the center of the drive assembly, and the magnetic fields direct the hot fusion plasma out the back for thrust. It seems like the main question is how much energy you get from burning 1 kg of deuterium—helium-3 mixture. If you are just burning it without worrying about using the reactants as a rocket, you will get 350 TJ/kg. Assuming 100% efficiency, complete burnup. and the ability to collect all the emitted energy (including neutrons). If you are using it for a rocket, however, it will be difficult to just find a way to only emit the reaction products without also letting the fusion fuel leak out. After all, you're producing the exhaust stuff in the middle of your fuel. Instead, what you probably do is heat the fusion fuel with the fusion reaction until it is at 100 keV of energy, and let the hot plasma escape as your rocket plume. This will produce 29 TJ of useful work for each kg of fuel/propellant expended. Since you're losing about 25% of your energy to neutral particle radiation, your actual fusion reaction will be producing more like 39 TJ/kg. But you can't use the latter figure in any of your thrust equations because the bremsstrahlung and x-rays won't be doing you any good. For the question about the contribution of visible, infrared, and ultraviolet light to the heating, it will be negligible. Actually, it should already be included in the bremsstrahlung losses, but the spectrum of the bremsstrahlung at 100 keV is so heavily peaked toward the x-ray spectral region that lower frequency stuff will be tiny in comparison. You will get some minor corrections to the spectrum when the fusion exhaust fuel/propellant is optically dense (that is, light produced inside it has difficulty getting out) leading to a black body spectrum over the optically dense spectral regions — but any practical fusion fuel will be optically thin to x-rays so this will not make much of a difference. I think you (Winchell) already have a good description of the likely appearance of a torch drive nozzle on your site, with diagrams of magnetic nozzles and blade shields. If I missed something, or there are other questions, let me know. From Wikipedia Nuclear Fusion the energy of the He-4 particle from D - He-3 fusion is 3.6 MeV, and the energy of the proton is 14.7 MeV. 1 MeV is 1,000,000 times 1.602×10-19 J (1.602×10-13 J). This gives the energy of the reaction products of a singe D - He-3 fusion. The mass of a He-3 atom is 3.016 AMU (atomic mass unit, also sometimes denoted u), the mass of a deuteron is 2.014 AMU. One AMU is 1.66E-27 kg. This lets you find the mass of all the reactants going in to the fusion reaction. Divide the one by the other and you get the specific energy (energy per unit mass) of the fusion reaction. A temperature can be shown to be the average energy per degree of freedom of the particles making up a system. So with a temperature of 100 keV, we find that we get 100 keV of energy per degree of freedom of the plasma. 1 keV is 1000 times 1.602E-19 J (1.602E-16 J). For an equal mixture of D and He-3, each ion has three degrees of freedom (it can move up-and-down, right-or-left, and forwards-or-backwards … or if you are more mathematically inclined one degree of freedom for each dimension on your Cartesian grid. Rotational degrees of freedom are probably not important). Each electron also has three degrees of freedom (for the same reason). If we take as our system of analysis one D atom and one He-3 atom, we have two ions (the D and the He-3) and three electrons (one for the D and two for the He-3). So our system has 15 degrees of freedom. Multiply this by the energy per degree of freedom and you get the thermal energy of the system. You already found out the mass of a D and He-3 atom, so divide by that to get the energy per unit mass. In proton-proton fusion, through a series of three reactions, four protons fuse to produce a single helium atom plus about 25Mev (million electron-volts), plus some stray gamma rays, neutrinos, and positrons. H1 weights 1.008 g/mole, so 1 kilogram contains about 992 moles of hydrogen, or 5.97 x 1026 atoms. Fusing these atoms produces 3.73 x 1027 Mev. There are 1.60 x 10-19 J/ev, so this is about equivalent to 5.97 x 1014 Joules, or about 19 MW-years. So there are about 19 MW-years of energy per kilogram of hydrogen. The smallest power plant which may be installed on a ship in Traveller is a standard "A" power plan. The A-plant can consume 20 tons of hydrogen over a period of a week, convert it to energy, and feed it to an "A" FTL drive. (This is how much energy is needed by the smallest FTL drive to make a jump of 1 parsec if installed in a 200 ton ship.) If we assume Miller is using metric tons (1 ton = 1,000 kg), an A power plant then can deliver 380,000 MW-years of energy over a period of one week. Over a year, it could deliver 19,800,000 MW-years. Thus, a single A power plant produces about 86 times as much energy in a year as all of the electrical generating plants in the United States. A single jump in Traveller uses about 160% of the energy the US produces in a single year. A "Jump 1" in Traveller corresponds to a travel distance of one parsec, about 3 1/3 light-years. Let us be generous and say a ship can travel 5 light-years at Jump 1, consuming 380,000 MW-years in the process. A Free Trader carries 82 tons of cargo, so the cost in energy to transport a kilogram is 380,000 divided by 82,000, or roughly 4.6 MW-years. This is about 5,000 times as good as the Boardman anti-matter drive, so that there is no doubt that interstellar trade in the Traveller universe is a good deal cheaper than in an Einsteinian one. It still takes 6.7 million KW-hours of energy to transport a kilogram, however. That is a lot of energy. Now it is true that energy is very cheap (in terms of Imperial credits) in Traveller — it has to be, given the cost of owning and operation an "A" power plant — but the cheapness of energy means that other manufactured goods must be very cheap. So there still will be few goods worth trading in Traveller. What goods will be worth trading is debatable, since it is very difficult to estimate costs of production. However, certainly trade in bulk goods like metal ores, pig iron, or grains can be ruled out. The Traveller trading system does make it possible to make a profit trading such goods, but that is a peculiarity of the system. I think we can say with some assurance that in Traveller the primary items of trade will be 1.) luxuries, 2.) extremely rare resources such as superheavy metals and — possibly — radioactives, and 3.) high-tech goods to be sold on planets where they cannot easily be produced locally. Mass drivers can get materials into space and beanstalks can get people into orbit, but to move around the solar system a drive of some kind is necessary. Fusion drives are a staple of science ﬁction for the simple reason that chemical fuels simpy lack the energy content required to make an interplanetary, let alone interstellar, civilization possible. However, the reality is that controlled fusion has proven a tremendously difficult genie to get out of its bottle even for simple power generation, an easier problem to solve than a space drive. The ﬁrst serious attempt at developing a fusion drive was Project Orion, which envisioned propelling a ship through the simple mechanism of kicking a nuclear bomb out the back and detonating it, repeating as necessary. This is hardly a graceful technique, but despite its seeming insanity it is not, a priori, unworkable. Caculation and experiment showed that a large “pusher plate” close to a nuclear explosion would experience a considerable acceleration——hardly surprising. More surprising is the fact that, given a thin protective layer of ablatable graphite, both the plate and a spacecraft on the other side of it could survive the detonation unscathed, could travel in a reasonably predictable direction and that a not-impossibly-large system of shock absorbers could make the ride survivable by people. Project Orion envisioned putting payloads measuring thousands of tons into orbit and saw a manned trip to Mars by 1965 and a trip to Saturn by 1970. However a bomb-powered spacecraft would inevitably generate a tremendous amount of radioactive fallout, and the accident risk involved with a ship carrying several thousand nuclear “pulse units” into orbit needs no elaboration. After the investment of several million dollars the project was shelved with the surface test-ban treaty. More advanced concepts have been put forward, including the British Interplanetary Society’s project Daedelus which proposed laser-imploded microfusion capsules as the drive source NASA’s Variable Speciﬁc Impulse Magnetoplasma Rocket (VASIMR) plasma drive uses many of the techniques relevant to a fusion drive and the Gas Dynamic Mirror (GDM) project (currently shelved to pay for shuttle refurbishment) was aimed at creating a true fusion drive. A primary stumbling block to the GDM drive is the availability of sufficiently strong magnetic ﬁelds. Beyond this problems to be solved are not small, given that even fusion power production still has large technological hurdles to clear. Fission power plants are now a ﬁfty-year-old technology, but ﬁssion rockets require too much shielding and operate at too low a temperature to be practical, even ignoring the specter of accident and widespread radiological contamination. The same concerns have left atomic cars and airplanes on 19505 drawing boards. Fission fuel contains millions of times more energy, kilo for kilo, than chemical fuel, but the realities of harnessing it conﬁne its use to large power plants. Fusion happens whenever atomic nuclei get close enough together that the short range but powerful attraction of the strong nuclear force can overcome the weaker but longer-ranged electrostatic repulsion of the positive protons in the nucleus. Fused nuclei are more stable together than apart, and the stability difference shows up as energy that can then be put to work. The key variables are temperature and pressure-—the nuclei have to be moving fast and be close enough together to make them fuse, and it takes a lot of both. Fusion bombs use no less a force than a fission bomb to heat and compress their fuel, but power generation and space drives (Project Orion excepted) require less violent methods. Adding to the headaches, the easiest fusion reaction to ignite is the deuterium-tritium reaction, and this gives off a lot of neutrons which require a lot of shielding, and which generate a tremendous waste disposal problem by slowly rendering the reactor itself radioactive. In addition tritium, also radioactive, must be made in a nuclear reactor at tremendous expense, generating more waste in the process (tritium is roughly eighty times the cost of plutonium, weight for weight). Current reactor concepts cleverly use the neutron ﬂux from the fusion reactor itself to make more tritium, solving some of the neutron contamination problem at the same time, but it would be nice if we could tap into fusion power without having to deal with radioactive waste at all, and preferably without using exotic and expensive isotopes either. The primary fusion pathways in the sun (the proton- proton chain, which burns normal light hydrogen and the carbon-nitrogen-oxygen catalysis cycle, or CNO cycle, which burns light hydrogen using carbon-12 as a catalyst) are aneutronic—fortunately for us, as any large-scale neutron flux from the sun would certainly bake our planet sterile. The sun uses nothing more than gravity to produce a stable, long-lived,‘ high-ﬂux fusion output without too many nasty side effects. In a star temperatures of ten. million degrees and densities of 100 gm/cm3 are required for the p-p chain and sixteen million degrees and densities of over 150 gm/cm3 for the CNO cycle. For the sun, which is held together by gravity and isn’t going anywhere in a hurry, temperature and pressure are the end of the story, but for an artiﬁcial fusion reactor a third critical variable enters the picture—conﬁnement time. This is the length of time the system can hold the fusing plasma together against the expansion caused by the fusion energy. This expansion lowers the pressure and temperature and eventually stops the reaction. In order for fusion to occur efﬁciently at a given temperature the plasma particles have to be held together long enough for a signiﬁcant number of fusion events to occur. Lawson’s criterion, the product of particle density and conﬁnement time, serves as a ﬁgure of merit for fusion reactors, and successive generations of research machines have striven to come ever closer to the magic point of breakeven, where the reactor produces as much power as it consumes, and ignition, where the plasma burn becomes self-sustaining, requiring no further energy input from outside. (The third magic point, proﬁtability, the point where a fusion reactor produces power for something like a nickel per kilowatt hour, is nowhere on the horizon.) 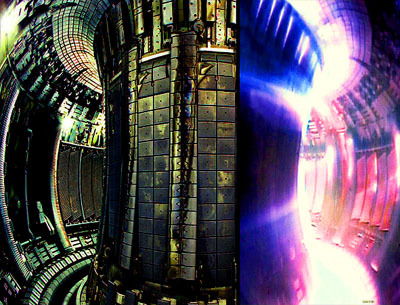 The oldest and best-explored fusion scheme, the toroidial magnetic tokamak, uses low pressures (a few atmospheres), long conﬁnement times (a few seconds to half an hour) and temperatures of hundreds of millions of degrees to achieve fusion. The more recent inertial confinement fusion approach uses intersecting laser beams to compress a tiny fuel pellet to pressures more than ten million times higher. Fusion occurs so quickly in this regime that the fuel pellet’s own inertia holds it together for the nanoseconds necessary for the reaction to complete. A third fairly recent development is magnetic target fusion, which magnetically implodes a thin-walled aluminum cylinder to achieve a fusion regime intermediate between these two. MTF achieves, for a few microseconds, magnetic ﬁeld strengths of 500 Tesla. Given that all of these techniques are barely capable of generating fusion with deuterium-tritium it may seem needlessly ambitious to plan a drive around the CNO cycle. Even granted that we want aneutronic fusion, the proton-proton chain is available at much lower pressures and temperatures. However, the CNO cycle’s reaction rate goes up no less than 350 percent for every 10 percent increase in temperature, rising as the sixteenth power of temperature, compared to the proton-proton chain’s reaction rate which goes up as the fourth power of temperature. This means that, given the ability to reach this extreme regime, it should be possible to reach a point where the CNO cycle will become very efficient. The trick of course is reaching the CNO operating point at all, and whether this is possible is an open question—even buckytube supermagnets might not do the job. However if they do, the system might work like this. Imagine a hollow tube ringed with magnetic coils. A small stream of hydrogen and carbon plasma is fed in at one end, and a current is run through it to generate its own magnetic field. A magnetic wave is sent down the tube by successively energizing rings of magnets. This wave accelerates the ionized gases down the tube, and the wave amplitude is made to increase down the tube while the wavelength decreases, the gases will also be compressed and heated as they travel. At some point, possibly with further energy inputs, the plasma begins to fuse. This tremendously increases its energy content——temperature and pressure soar and it begins to expand, still fusing. Forward and outward expansion are limited by the incoming magnetic wave, still increasing in amplitude, and the reaction forces of fusion particles moving against this wave provide thrust for the ship. Wave amplitude decreases and wavelength increases past the fusion point, allowing the plasma to expand and stop fusing in that direction, focusing it into a coherent jet. Finally the plasma exits the rear of the tube through another magnetic ﬁeld which uses the stream of charged particles to generate electrical power to run the system. Behind the tube is a reaction chamber into which water can be sprayed to trade exhaust velocity for thrust for planetary launch. Once in orbit we turn off the water and use the jet by itself to accelerate. Exploring the detailed physics of this system is far beyond the scope of this discussion. In a story it’seasy to gloss over details like plasma disruption and wall interactions, but these are critical problems for real-world reactors. This may be the drive of the future; it may, like Project Orion and the atomic airplane, be possible but impractical; or it may be simply impossible. Assuming it is possible then the magnetic wave system means the thrust would be continuous and very controllable. This is the fusion equivalent of a jet engine with constant, or nearly constant, combustion, as opposed to a pulsed fusion drive (Project Orion being the extreme example) which, like a piston engine, produces power in discrete bursts. This steady, throttled power is exactly what we’re looking for, and this drive is easily adaptable to the fusion ramjet concept which gathers its fuel from the interstellar medium as it travels. It should be noted though that the fusion ramjet requires solving even larger problems than a “simple” fusion drive, including the generation and control of a magnetic funnel about the size of Iupiter. Even buckytube supermagnets are probably inadequate to this task, but a ﬁeld too small to serve as an interstellar fuel scoop could still serve Well as an unconﬁned magnetic particle shield. As discussed above, some sort of particle shield is absolutely essential for manned interplanetary ﬂight, with or without a fusion drive system, and supermagnets like this are a primary enabling technology. Solving the shield problem like this would open up the solar system to large-scale exploration and completely revolutionize the commercialization of space. Even if we don’t want to colonize Mars or set up an asteroid-mining industry the scientific beneﬁts alone would be incalculable. What is the theoretical limit of the amount of energy that can be extracted from a fusion reaction? I am not talking about the practical efficiency of a reactor, but rather what fraction of the mass-energy can be released. Of the theoretically possible fusion reactions, combining 56 free nucleons into 56Fe would release 9.1538 MeV per nucleon. 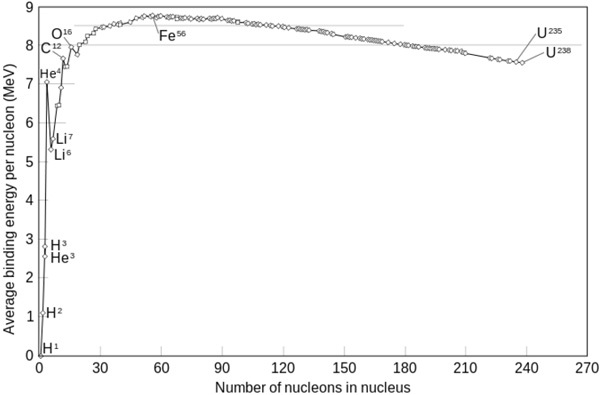 Combining 28 free protons and 34 neutrons into 62Ni would give a slightly tighter binding per nucleon. This seems to represent an empirical limit to fusion, converting 0.00935605478 (iron) and 0.0096783439 (nickel) of the nuclear mass into energy. So this limit seems to be ≈0.97% (0.0097). By comparison, the proton-proton chain leading to 4He is 0.7% efficient (0.007).